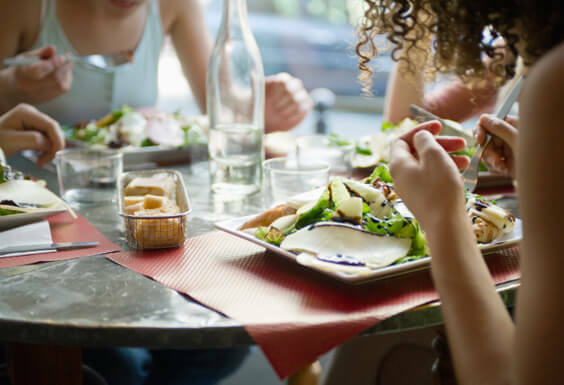 Eating out has become part of the American culture and for many of us, it is part of our daily routine. Most of us need about 2000 to 2500 calories per day to maintain our weight. However, with restaurant meals averaging well over 1000 calories a meal, it is easy to see how quickly this habit can lead to weight gain. In 2005-2006 I was at my heaviest weight (about 20lb more than I do now). In fact, I would attribute most of the weight gain to the fact that I ate at least 2 meals per day out. Sure I ate salads, and usually skipped dessert but I still managed to gain about 15lb. Fortunately, it is possible to enjoy dining out without having to stress about the repercussions. Skip bread and chips. I have learned to accept the fact that I have no control once I get started on a bread or chip basket. To make matters worse, when you consider the queso or olive oil that accompany these baskets, it’s easy to see how you can sneak another 500+ calories into your meal. Don’t assume salads are the healthiest choice. Salads can be tricky because of the number of ingredients on them. If you take the time to read through the nutrition facts at most restaurants you will find that many of the salads have close to the same amount of calories as the burgers! Cheese, croutons, dressings and nuts can add up quickly. If you do opt for a salad, get the dressing on the side and stick to the clear dressings. A better option would be to order your favorite lean protein (chicken breast, fish or even beef tenderloin) with a side of vegetables. Every restaurant I have ever been to has been willing to accommodate a special request like this so it should not be a problem. You can even add a small amount of butter to your vegetables to make them taste better, but be sure to do this yourself so you can control the portion (about 1 tbsp). Drink only water. Your average adult beverage is going to have anywhere from 150-250 calories per serving [click here for a list] and sodas and sweet teas are similarly bad or worse. Skipping these high calories beverages is always a good idea- especially when your dining out. If you must drink, a dry red wine will be your best bet- just limit yourself to 1-2 small glasses at the most. Skip dessert and appetizers and instead enjoy your entree. It goes back to the idea of portion control. You can safely assume that all restaurant meals will be higher in calories compared to what your would prepare at home, so do yourself a favor and minimize the damage by sticking to your entree. See my post on Beating food cravings if you are looking for motivation to behave. Leave food on the plate. Awareness of what we are eating is one of the most important things we can teach ourselves. There is a well known saying among the Okinawans in Japan [who are along some of the longest living people on earth] “Hara Hatchi Bu” or eating until you are 80% full. In our plate cleaning culture, setting out with the intention to leave some food on our plates is another tool we can use control our portions.